Your Tai Chi clothing should be comfortable and your shoes should be supportive, but light. Too much structure on the sole of the shoes may impede the turning in of the feet in the movements of the Tai Chi form. Therefore, many people choose sneakers or trainers, while others prefer more traditional canvas shoes. Depending on the underground in the training room (wood, linoleum, concrete or even carpet) and the room temperature you could even make your first Tai Chi steps in warm socks, especially when you are training inside and your focus lies on callisthenics rather than martial arts training. For outdoor classes – e.g. on grass in the famous early morning dew – you might want to make sure that your shoes are waterproof. Light outdoor shoes might be an option here. 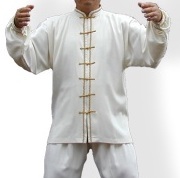 Your Tai Chi clothes should allow all kinds of arm and leg movements. Wide – not too wide – and stretchy is to be preferred over tight and stiff. Your clothes should keep your body warm, so that muscles and sinews are not unnecessarily strained during the training. Sports clothes as well as clothes for relaxation might do the job. Generally, trousers are worn long, complemented by a t-shirt, a long-sleeved shirt or a hoodie jacket, depending on the temperature. It is best to let you guide by your own temperature perception. As generally you will not sweat too much during the training – though this depends on the specific class or school you will be going to – your normal outfit for light sports may be the right choice. Some schools have a special way of clothing. Sometimes, it is just the use of a specific colour that evolved over time. School styles vary from casual outfits – school t-shirts and the like – to more conservative clothing, which is sometimes described as traditional. Traditional clothing may include long shirts reaching down almost to the knees with traditional buttons or wrap pants. Chinese silk suits, which look stunning, but may remind the Western onlooker a bit of pyjamas, are usually only worn for tournaments or formal demonstrations, but seldom in everyday training. If you are unsure what to wear, you may want to find a compromise between “fitting in” and wearing what feels best for you, as you do not want uncomfortable or inconvenient clothes to impair your practice.